Kotobuki is a small; family owned and operated business that specializes in renting traditional, formal Japanese wedding attire. Since 1992, we have made many people's weddings and events special. Founder, Kiyomi, is bilingual in Japanese and English. Kiyomi is excited to share her collection of beautiful formal kimonos, yukatas, and shi-chi-go-sans. We have a variety of ensembles available for men, women and children for any event; not just weddings. 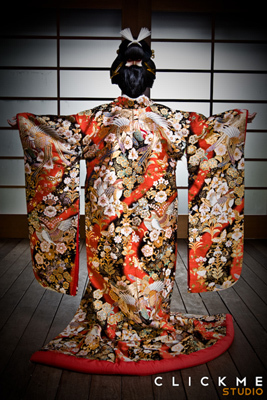 In addition to renting our collection, we can assist you with your own kimono. We are experienced in the traditional methods of dressing for all occasions; formal and informal. We can travel and be available to dress many people for a specific event. Our studio is located near Seattle, where we are available to show our collection by appointment only. Please contact us with any questions; we would be happy to talk about your event.